The number of vacancies in education is growing strongly. In primary education the problems are greatest in the Randstad, but these will expand over the rest of the Netherlands in the coming years, UWV benefits agency announces Tuesday. In the first three quarters of last year, 35,000 vacancies were open, the same as in the whole of 2017. In secondary schools it is especially difficult, according to the UWV, to get lecturers in languages ​​and exact subjects, such as mathematics and chemistry, in front of the classroom. The number of vacancies in education has been growing for years. This is because a relatively large number of over-55s in the sector are retiring. Schools try to solve the teacher shortages for ages by attracting young people and business people to the profession. They also try to recruit teachers from other regions. "It is not only the recruitment of personnel that is important, but also the retention, which can be achieved by being an attractive employer, paying attention to, for example, terms and conditions of employment, atmosphere, work pressure, schedules and sustainable employability", according to the UWV. In total, 333,700 people work full-time in government-funded education. Most of them work in primary education (36 percent), a quarter in secondary education. 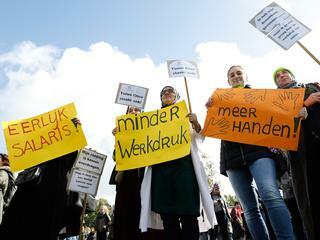 Some schools in the Netherlands only teach for four days, because the manpower for the regular five-day school week is missing. It also happens that classes are sent home because a teacher is sick. Are you a teacher in primary education? In the NUjij reactions, let us know what you notice about the teacher shortage.